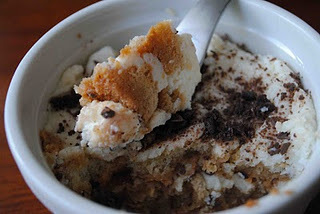 One of my favorite desserts has always been tiramisu. I don't get it very often, but there is something about the creamy texture and the strong coffee flavoring that is amazing to me. I never thought that I'd make it on my own, mostly because I figured it was very complicated. I also assumed that it made a lot, and since it is so rich, I didn't want to end up eating an entire pan of it all by myself. When I was flipping through the pages of my Sunlight Cafe cookbook by Mollie Katzen, I found a recipe for a version of tiramisu that feeds only 2. The way that the recipe is described at the top of the page was enticing, too. "Traditionally, tiramisu is made with mascarpone (a very rich Italian cream cheese) and eggs. This lighter variation is made with ricotta, which is much leaner and higher in protein than mascarpone, so you can feel entitled to eat it for breakfast-a guilty pleasure without the guilt!" Oh boy, it is almost as if they wrote that description for me. Guilt-free tiramisu? Sign me up! Place the chocolate chips in an electric spice grinder or blender and grind them into a coarse meal. OR, you can just chop them by hand, which is what I did. Place the ricotta in a medium sized bowl. Add the sugar and mix it in with a fork or small whisk. Spoon about 2 tablespoons of the sweetened ricotta into each of two 6-ounce ramekins. Sprinkle about 1 tablespoon of the ground chocolate over the ricotta. Lay 3 ladyfingers on top of the chocolate, overlapping them if necessary. Sprinkle the ladyfingers with 1-2 tablespoons of the espresso. Repeat the layers: cheese, chocolate, ladyfingers, espresso. Addle a final dab of cheese, and sprinkle the top with a little more chocolate for a finished look. Wrap each ramekin tightly with plastic wrap, and refrigerate for a minimum for 4 hours, preferably overnight, to let the layers meld. Serve cold. *I put my ladyfingers in a baking dish and poured the coffee over the top of them all instead of just sprinkling the coffee over the top of the layers. This way, each of the ladyfingers absorbed the coffee and they also became more pliable for me to fit them in my ramekins.